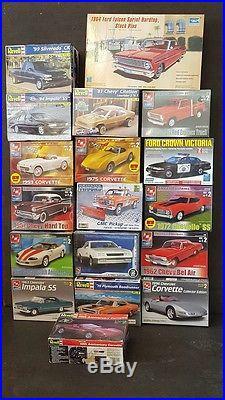 New or Open but Complete and not started: 1 LOT of 18 Model Kits. All are 1/25 or 1/24 Scale. 16 sealed, 2 unsealed but complete and sealed inside as the factory made it. The lot is a good bargain. Revell 1/24'70 Plymouth Roadrunner 440 SEALED. AMT 1/25 1963 Impala SS SEALED. AMT 1/25 1957 Chevy Hardtop SEALED. AMT 1/25 1953 Corvette SEALED. Revell 1/24 40th Anniversary Corvette Open Complete. AMT 1/25 1986 El Canino SS SEALED. AMT 1/25 1997 30th Anniversary Camaro Convertible SEALED. Revell 1/25 1999 Silverado CK Open Box Sealed inside. Trumpeter 1/25 1964 Ford Falcon Spirit SEALED. Lindberg 1/25 Crown Victoria Calf. AMT 1/25 1972 Chevelle SS SEALED. AMT 1/25 1978 Dodge "Li'l Red Express" Truck SEALED. Revell 1/25 1994 Impala SS SEALED. Revell 1/24 1981 Chevy Citation Lowrider 3'n 1 Can be built stock SEALED. AMT 1/25 1975 Corvette Convertible SEALED. AMT 1/25 1962 Chevy Bel Air SEALED. AMT 1/25 1996 Corvette Convertible Collector Edition SEALED. Wonderful addition for any model kit appreciators and collectors! This will make a nice gift for the modeling. Please inspect the photo as it is part of the description. I will be listing other models and items as time permits. The item "LOT of 18 Trumpeter, Revell, AMT, Lindberg Auto/Truck Model Kits" is in sale since Sunday, May 07, 2017. This item is in the category "Toys & Hobbies\Models & Kits\Automotive\Vintage". The seller is "vicviral" and is located in Hudson, Florida.